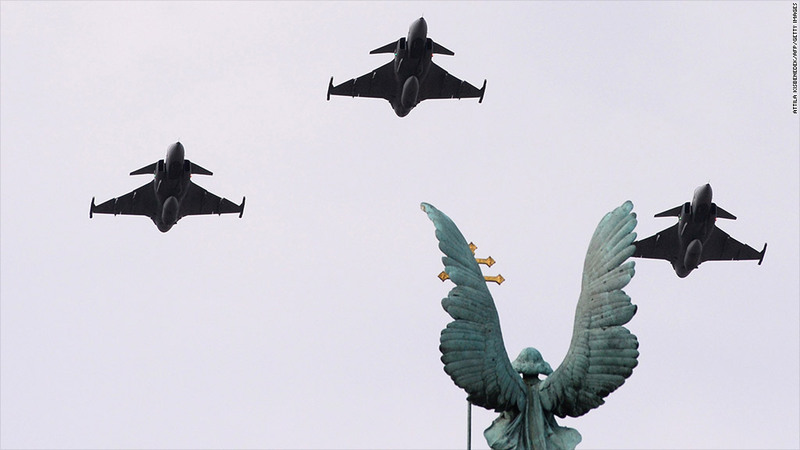 The Brazilian government announced Wednesday that it would buy 36 Gripen fighter jets from Saab. Shares in Saab soared by just over 30% Thursday after the Swedish company announced a $4.5 billion deal to supply the Brazilian government with new fighter jets. The deal came as a surprise to investors who had been expecting Boeing (BA) to win the lucrative contract. Boeing shares slipped 0.3% Wednesday, under-performing U.S. markets which posted big gains after the Federal Reserve announced plans to trim its economic stimulus program. Local media have speculated that Boeing lost out because Brazil was angered by reports that the U.S. government spied on President Dilma Rousseff. Brazilian officials sidestepped questions about how the spying scandal may have affected the decision. Speaking at a news conference late Wednesday, Defense Minister Celso Amorim said Saab was chosen for three main reasons: cost, performance and the ease of completing technology transfers. The competition for the contract had dragged on for roughly a decade, with France's Dassault (DASTF) also in the running. The deal will see Saab deliver 36 new Gripen aircraft to Brazil's air force by 2023. The Brazilian air force said the Swedish fighter jets will replace older Dassault-made aircraft. Countries already using the Gripen include Sweden, Hungary, Czech Republic, South Africa and Thailand. -- CNN's Shasta Darlington contributed to this report.